It may sound cliché, but no matter how beautiful the packaging, it’s what’s inside the bottle that really counts. We feel it’s our responsibility to bring you products with unparalleled performance that respect the environment and your health. We only use products that not only provide performance, but maintain a high level of integrity with unique ingredients and performance benefits above all. You can now purchase Eufora products online! Click the link below from our website and purchase your products directly from Eufora! A complete regimen for all types of curly hair! Each product in the Curl’n collection is formulated with a unique complex of ingredients to help condition and hydrate the hair to reduce moisture loss, control frizz, improve flexibility and hold curl. No matter the curl pattern, Eufora’s Curl’n Promise offers a complete regimen of products to work with, not against curly hair to enhance and define and control leaving clients with Beautiful, Vivacious Curls! Sulfate-free, gentle cleansing and lightweight formula enhances curls and waves. Restores moisture for shiny, healthy and bouncy curls. Unique non-lathering conditioning cleanser provides intense hydration for extra dry, frizzy and over-styled hair. Lengthens tight curls without sacrificing form or bounce. Nutrient rich daily conditioner restores moisture without adding weight. Detangles and controls frizz for soft, lively and manageable curls. Serious nourishment for dry curls and waves. Strengthen, control frizz and moisturize with this deep conditioning treatment. Protects curls and combats damage from heat styling. Dual-purpose wet and dry formula for all curl types is the ultimate leave-in curl enhancing prep spray for perfect frizz free curls. Revitalizes second day curls. Enhances and defines curly hair. Tames frizziness and fights humidity. Creates, soft moveable and touchable curls. Provides hold without crunch that lasts throughout the day. Styling cream with the right amount of control to create, define and shape curls. Leaves hair soft, touchable and shiny. Anti-humidity formula provides ultimate frizz protection. A complete regime to smooth, soften and control frizz! Each product in the Eufora Smooth’n Collection is formulated with amino acids, vitamins and a unique blend of natural oils that work to strengthen and protect the hair shaft while delivering exceptional moisture, shine, smoothing and de-frizzing results. Eufora’s Smooth’n Promise offers a complete regimen with progressive smoothing benefits that will leave hair velvety smooth, silky and shiny! Gentle sulfate-free cleansing, formulated with Eufora’s proprietary blend of active ingredients; Moringa, Abyssinian, Safflower, Olive Oils and Shea Butter leave hair looking and feeling undeniably silky, shiny and smooth after just one use. Daily conditioner offers ultimate frizz and humidity protection. Extra moisturizing formulation of our unique complex of nutrients, natural oils and extracts, smoothes and seals a frazzled cuticle and helps repair split ends. Multi-benefit prep spray moisturizes, detangles and prevents breakage and damage caused by the use of styling and hot tools. Offers the ultimate in thermal protection up to 450 degrees. Now with more control! Unique styling tool with exceptional leave-in conditioning benefits. Gives you added control during the blow dry and styling process. Straightens and smoothes frizzy, curly and wavy hair with staying power but still leaves hair soft and moveable without stiff or tacky feeling. Non-greasy, frizz-fighting formula contains a maximum dose of antioxidant enriched oils that nourish and protect the cuticle. Our unique blend of Moringa, Abyssinian, Safflower and Olive Oils along with the power of Shea Butter helps to increase manageability and strength of the hair. Seals in moisture and provides maximum shine leaving hair silky smooth without adding weight. Replenish, Moisturize, and Deliver Extra TLC! 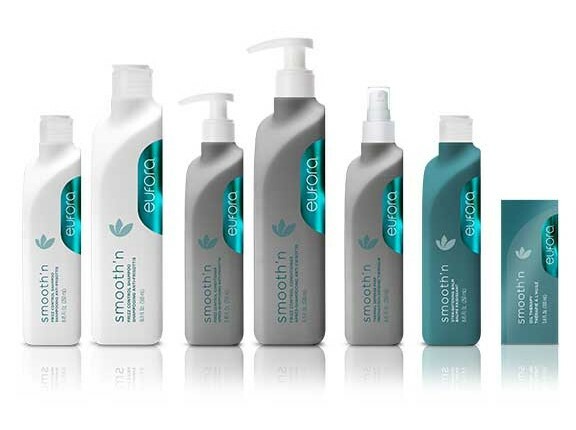 Eufora Nourish Products utilize unique and effective plant extracts, minerals, vitamins, essential oils and proteins to strengthen, protect and replenish the hair. Key nourishing ingredients include Kukui, Neem, Cranberry Oils and extracts of Horse Chestnut,Chamomile, Yarrow Root and Nettle. promise collections, rounding out complete and customized hair care regimens designed to care for every type of hair. Weightless moisturizing shampoo, replenishes dry and stressed hair. Imparts softness, shine and manageability. For normal to dry hair. Sulfate-Free with extra moisturizing benefits. Restore softness and manageability to coarse, dry, chemically processed or damaged hair. Detoxifying treatment gentle enough for daily use. This sulfate-free shampoo removes dulling impurities and build up caused by products, metals, chemicals, minerals and environmental pollutants. Restores vitality and color vibrancy. Eufora’s unique, 100% biodegradable formula utilizes a chelating ingredient, derived from Meadow Foam Seed that is gentle and safe for people and the planet. A weightless, protein-rich, daily leave-in moisturizing treatment. Provides hydration and frizz control without weight. Helps prevent UV sun damage, and protects from environmental stresses and color fading. Now with extra moisturizing and conditioning benefits. Restores softness, shine and manageability. Intensive protein-rich restructuring and replenishing treatment, restores moisture, and vitality to dry, stressed and damaged hair. Helps soothe scalp and skin irritations. Extracts of Menthol and Camphor work to stimulate circulation to promote a healthy scalp environment. A Keratin Protein rich restructuring solution for weak, brittle and damaged hair. Increases the strength and elasticity and evens the porosity of the hair. Weightless formula brings life back to damaged hair. Unique oil complex for hair, skin and scalp with Kukui, Argan, Neem and Cranberry Oils that are rich in Omega Fatty Acids, Vitamins and Minerals. This non greasy, lightweight, and fast absorbing serum delivers superb moisture, softness and shine with antioxidant and antibacterial benefits. AMP’d up formula now delivers more noticeable volume, softness and shine. Balanced Proteins, Botanicals and Keratin Amino Acids work to restore body to thin, fine and lifeless hair. Weightless conditioning formula won’t leave hair parched and thirsty. A truly multifunctional promise. Aloetherapy has at its foundation the best beauty secret nature has to offer in Alie Stem Cells, derived from Certified Organic Aloe. This long standing and proprietary Eufora science is then super charged by harnessing the power of innovative plant and flower technologies found in Water Lily and Oat to deliver a uniquely calming and memorable experience. Gentle cleansing for hair and body, perfectly balanced to calm, soothe and replenish sensitive scalp and skin. Moisture rebalancing that softens and soothes without build up or added weight. Leaves hair shiny and replenished with enhanced softness. A versatile moisture mist to soothe and calm both scalp and skin. Delivers instant hydration. Perfect for after sun soothing! Smooth and soften parched, dry skin with this non-greasy mega moisture. Vitamins A, C, D and E provide increased skin elasticity and improved circulation. Luxury for your lips. Intense hydration properties found in Aloe, Beeswax and Vitamin E work to seal in moisture, keeping lips soft, smooth and supple. Beautifying Elixirs™ provides the most advanced solution for damaged, dull, brittle and frizzy hair. Hair color is protected from fading and stays vibrant longer than ever before. Restore your inner strength with Bodifying Shampoo and Conditioner. These innovative formulas provide gentle cleansing and weightless moisturization to rejuvenate dry, brittle and damaged hair. You’ll be obsessed with running your fingers through your hair. Be in control of coarse, curly, frizzy and damaged hair. Get soft, smooth and moisturized hair that is resilient to breakage. Hair moves and flows with superior shine and more vibrant color. Lightweight, fast absorbing oil blend brings faded, dull, damaged and dry hair back to life. Non-greasy frizz control and unbelievable silky softness and shine with antioxidant benefits. A great treatment for healthy scalp and dry skin. Humidity doesn’t stand a chance with this versatile, workable finishing spray. Delivers the right amount of hold and control and leaves your hair touchable, moveable, soft – not stiff. Delivers great shine and protects against color fading and helps you win the fight against frizz. Whether avante-garde, architectural shapes or comfortable silhouettes speak to your style sensibilities. EuforaStyle lets you celebrate the beauty of individuality. EuforaStyle is more than just a collection of styling products. It’s about an attitude, a state-of-mind that gives you the confidence to present your unique personal style to the world. Leaves hair moveable and touchable without stiff or sticky feel. Provides protection from color fading. Maximum hold for long lasting style retention. Dependable in any weather. Locks out humidity, reduces frizz and protects against color fading. Perfect for artistic styling. Creates definition, builds texture and shape. Adds dimension to layers and tames frizz to provide a re-workable, pliable and strong hold. Unique, light-weight finishing gloss adds beautiful luster. Controls frizz and flyaways without any greasy feel. A versatile styling wax with medium to strong hold, creates texture and separation with added shine. Lightweight formula, builds lift at the root to make fine and flat hair look and feel thicker and fuller. Delivers lasting volume and control. For versatile wet/dry styling and finish. Adds fantastic texture and dimension. A little sprinkle – a lot of lift. This liquid powder provides a unique way to achieve instantly thicker, fuller hair and great root lift that lasts all day. Versatile and unique styling solution to sculpt, create volume, texture and control. Helps protect from sun damage and color fading. Universal styling prep for all hair types. Adds body, manageability and control during the blow dry process. Helps to reduce frizz and static flyaways. Creates abundant texture, density and volume with staying power that lasts all day into the night. Great for every hair type. A must have for flat, or fine hair. For that fresh from the beach look. Adds light texture, body and light hold with a matte finish. Easy fix for flat, lifeless and fine hair with sun protection. Creates beautiful shine without adding weight. Helps detangle wet hair and eliminates frizz. A versatile, medium shine, texturizing and molding pomade. Creates a flexible, re-workable, lasting hold. Eufora’s Thickening products deliver the latest in scalp and hair science technology for thicker, fuller and healthier hair. These zero weight, antioxidant rich formulas deliver silky softness without adding weight. elasticity of the hair bringing back the look and feel of healthy, beautiful hair. Being healthy is always beautiful and it starts with good nutrition. Eufora’s Nutritional Support is a specialty supplement that provides just the right balance of nutrients to support healthy hair, nails and skin. This innovative formula provides essential B-vitamins, amino acids and important antioxidants. An advanced formula that works above and below the scalp to nourish, protect and deliver essentials nutrients for a healthy scalp environment. Includes Eufora’s ProAmino Cell Complex, a proprietary breakthrough technology that works to improve the health of your scalp and hair follicle, where all healthy hair begins. A zero weight styling solution that delivers thicker, fuller hair when blown dry into the hair. Eufora’s ProAmino Cell Complex in combination with Botanical Extracts, Amino Acids and Antioxidants provides leave-in treatment benefits to improve the strength and elasticity of the hair. Provides light styling control and volume.